The development of interactive displays has transformed the traditional museum world in the last decade. Visitors are no longer satisfied by simply gazing at worthy displays in glass cases - they expect to have hands-on experience of the objects and be actively involved with the exhibits, learning informally and being entertained simultaneously. Hands-on museums and science centres provide the most remarkable example of how museums are redefining their roles in society - improving access to real objects and real phenomena, so that they can be enjoyed by more people. In recent years museums have been thrust into intense competition for the public's time and money with all branches of the leisure industry, from commercial theme parks to retail shopping and home entertainment. This has upset the traditional stability of the museum and their visitors. A hands-on approach encourages a broader visitor base, which in turn helps to bring in additional revenue at a time of declining public subsidy. Tim Caulton investigates how to create and operate effective exhibitions which achieve their educational objectives through hands-on access. 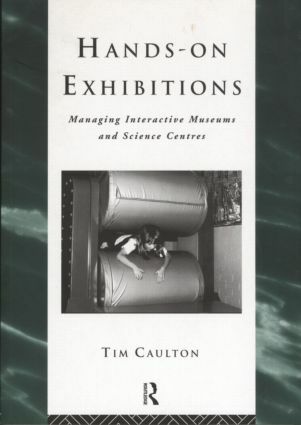 He concludes that the continuing success of hands-on museums and science centres hinges on attaining the very best practice in exhibition design and evaluation, and in all aspects of operations, including marketing and financial and human resource management. Hands-On Exhibitions provides a practical guide to best practice which will be indispensable to all museum professionals and students of museum studies. Tim Caulton has been involved in the development and management of museums for over a decade, including member of the team developing Eureka! the museum for children in Halifax. He works freelance developing new museums, and lectures at the University of Sheffield.